I’ve mentioned loving breakfast for dinner several times before. While I’m all for keeping it simple most of the time, every once and awhile it’s nice to do something a little nicer. Eggs benedict is the epitome of fancy breakfast for me, but I actually hate hollandaise. This avocado sauce is amazing. Enjoy! 2. In a bowl, combine flour, cornmeal, soda, salt, pepper, corn, bell pepper, green onion, and garlic. Add egg, milk, and 1 tablespoon olive oil. Mix until just combined. 3. Line a baking sheet with parchment paper. Spoon about ⅓ cup of batter in rounds spaced apart on baking sheet. Bake for 15-20 minutes until golden. Set aside. 4. Combine avocado, lemon juice, water, 2 tablespoons olive oil, and pepper in a food processor. Process until smooth. Add more water if needed to thin to desired consistency. 5. 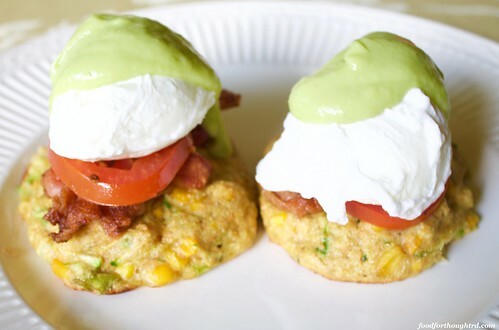 To serve, put 1 slice bacon and 2 tomato slices on top of a corn cake. Put a poached egg on top of that. Spoon avocado sauce over the top.